A Fine and Large 19th Century Oil on Canvas After Bartolomé Esteban Murrillo's (Spanish, 1617-1682) "Beggar Boys Playing Dice" (The original work by Murillo was painted in 1675). The impressive artwork depicts two young boys playing dice while another eats a piece of fruit as his dog watches on., within an ornate gildwood and gesso frame bearing a label from the faming company Bigelow & Jordan. The original work by Murillo is currently at the Alte Pinakothek Museum in Munich, Germany. 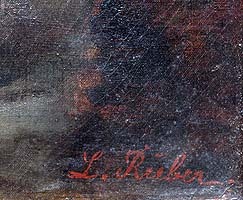 The present work is signed: L. Rüber. 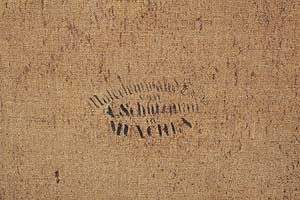 Circa: Munich, Late 19th Century. Bartolomé Esteban Murillo (born late December 1617, baptized January 1, 1618 – April 3, 1682) was a Spanish Baroque painter. Although he is best known for his religious works, Murillo also produced a considerable number of paintings of contemporary women and children. These lively, realist portraits of flower girls, street urchins, and beggars constitute an extensive and appealing record of the everyday life of his times. Murillo was born to Gaspar Esteban and María Pérez Murillo. He may have been born in Seville or in Pilas, a smaller Andalusian town. It is clear that he was baptized in Seville in 1618, the youngest son in a family of fourteen. His father was a barber and surgeon. His parents died when Murillo was still very young, and the artist was largely brought up by his aunt and uncle. Murillo began his art studies under Juan del Castillo in Seville. There he became familiar with Flemish painting and the "Treatise on Sacred Images" of Molanus (Ian van der Meulen or Molano). The great commercial importance of Seville at the time ensured that he was subject to influences from other regions. His first works were influenced by Zurbarán, Jusepe de Ribera and Alonzo Cano, and he shared their strongly realist approach. As his painting developed, his more important works evolved towards the polished style that suited the bourgeois and aristocratic tastes of the time, demonstrated especially in his Roman Catholic religious works. In 1642, at the age of 26, he moved to Madrid, where he most likely became familiar with the work of Velázquez, and would have seen the work of Venetian and Flemish masters in the royal collections; the rich colors and softly modeled forms of his subsequent work suggest these influences. In 1645 he returned to Seville and married Beatriz Cabrera y Villalobos, with whom he eventually had eleven children. In that year, he painted eleven canvases for the convent of St. Francisco el Grande in Seville. These works depicting the miracles of Franciscan saints vary between the Zurbaránesque tenebrism of the Ecstasy of St Francis and a softly luminous style (as in Death of St Clare) that became typical of Murillo's mature work. According to the art historian Manuela B. Mena Marqués, "in ... the Levitation of St Giles (usually known as the "Angel’s Kitchen", Paris, Louvre) and the Death of St Clare (Dresden, Gemäldegal. Alte Meister), the characteristic elements of Murillo’s work are already evident: the elegance and beauty of the female figures and the angels, the realism of the still-life details and the fusion of reality with the spiritual world, which is extraordinarily well developed in some of the compositions." 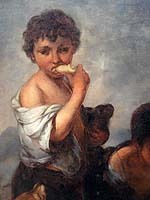 Also completed c. 1645 was the first of Murillo's many paintings of children, The Young Beggar (Musée du Louvre), in which the influence of Velázquez is apparent. Following the completion of a pair of pictures for the Seville Cathedral, he began to specialize in the themes that brought him his greatest successes: the Virgin and Child and the Immaculate Conception. After another period in Madrid, from 1658 to 1660, he returned to Seville. Here he was one of the founders of the Academia de Bellas Artes (Academy of Art), sharing its direction, in 1660, with the architect Francisco Herrera the Younger. This was his period of greatest activity, and he received numerous important commissions, among them the altarpieces for the Augustinian monastery, the paintings for Santa María la Blanca (completed in 1665), and others. He died in Seville in 1682 at the age of 64. Murillo had many pupils and followers. The prolific imitation of his paintings ensured his reputation in Spain and fame throughout Europe, and prior to the 19th century his work was more widely known than that of any other Spanish artist. Artists influenced by his style included Gainsborough and Greuze. The Museo del Prado in Madrid; Hermitage Museum in Saint Petersburg, Russia; and the Wallace Collection in London are among the museums holding works by Murillo. His painting Christ on the Cross is at the Timken Museum of Art in San Diego. Christ After the Flagellation is at the Krannert Art Museum, Champaign, Illinois. His work is also found at the Mabee-Gerrer Museum of Art in Shawnee, Oklahoma, and at the Meadows Museum at Southern Methodist University in Dallas, Texas. Bartolomé Esteban Murillo (born late December 1617, baptized January 1, 1618 – April 3, 1682) was a Spanish Baroque painter. Although he is best known for his religious works, Murillo also produced a considerable number of paintings of contemporary women and children. These lively, realist portraits of flower girls, street urchins, and beggars constitute an extensive and appealing record of the everyday life of his times. Murillo was born to Gaspar Esteban and María Pérez Murillo. He may have been born in Seville or in Pilas, a smaller Andalusian town. It is clear that he was baptized in Seville in 1618, the youngest son in a family of fourteen. His father was a barber and surgeon. His parents died when Murillo was still very young, and the artist was largely brought up by his aunt and uncle. 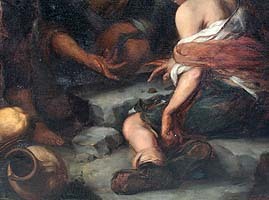 Murillo began his art studies under Juan del Castillo in Seville. There he became familiar with Flemish painting and the "Treatise on Sacred Images" of Molanus (Ian van der Meulen or Molano). The great commercial importance of Seville at the time ensured that he was subject to influences from other regions. His first works were influenced by Zurbarán, Jusepe de Ribera and Alonzo Cano, and he shared their strongly realist approach. As his painting developed, his more important works evolved towards the polished style that suited the bourgeois and aristocratic tastes of the time, demonstrated especially in his Roman Catholic religious works. In 1642, at the age of 26, he moved to Madrid, where he most likely became familiar with the work of Velázquez, and would have seen the work of Venetian and Flemish masters in the royal collections; the rich colors and softly modeled forms of his subsequent work suggest these influences. In 1645 he returned to Seville and married Beatriz Cabrera y Villalobos, with whom he eventually had eleven children. 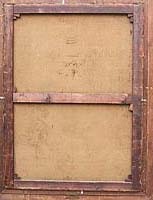 In that year, he painted eleven canvases for the convent of St. Francisco el Grande in Seville. These works depicting the miracles of Franciscan saints vary between the Zurbaránesque tenebrism of the Ecstasy of St Francis and a softly luminous style (as in Death of St Clare) that became typical of Murillo's mature work. According to the art historian Manuela B. Mena Marqués, "in ... the Levitation of St Giles (usually known as the "Angel’s Kitchen", Paris, Louvre) and the Death of St Clare (Dresden, Gemäldegal. Alte Meister), the characteristic elements of Murillo’s work are already evident: the elegance and beauty of the female figures and the angels, the realism of the still-life details and the fusion of reality with the spiritual world, which is extraordinarily well developed in some of the compositions." 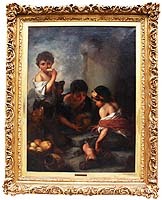 Also completed c. 1645 was the first of Murillo's many paintings of children, The Young Beggar (Musée du Louvre), in which the influence of Velázquez is apparent. Following the completion of a pair of pictures for the Seville Cathedral, he began to specialize in the themes that brought him his greatest successes: the Virgin and Child and the Immaculate Conception. After another period in Madrid, from 1658 to 1660, he returned to Seville. Here he was one of the founders of the Academia de Bellas Artes (Academy of Art), sharing its direction, in 1660, with the architect Francisco Herrera the Younger. This was his period of greatest activity, and he received numerous important commissions, among them the altarpieces for the Augustinian monastery, the paintings for Santa María la Blanca (completed in 1665), and others. He died in Seville in 1682 at the age of 64. 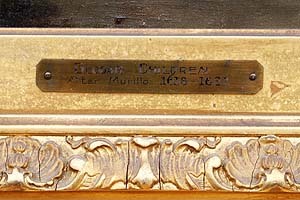 Murillo had many pupils and followers. The prolific imitation of his paintings ensured his reputation in Spain and fame throughout Europe, and prior to the 19th century his work was more widely known than that of any other Spanish artist. Artists influenced by his style included Gainsborough and Greuze. The Museo del Prado in Madrid; Hermitage Museum in Saint Petersburg, Russia; and the Wallace Collection in London are among the museums holding works by Murillo. His painting Christ on the Cross is at the Timken Museum of Art in San Diego. Christ After the Flagellation is at the Krannert Art Museum, Champaign, Illinois. His work is also found at the Mabee-Gerrer Museum of Art in Shawnee, Oklahoma, and at the Meadows Museum at Southern Methodist University in Dallas, Texas.